Seriously, this world is getting crazy. I was in the supermarket on August 20th and Christmas decorations were being sold. No, not last year’s decorations going on sales, this 4-months-from-now Christmas. Way to prepare for an event! 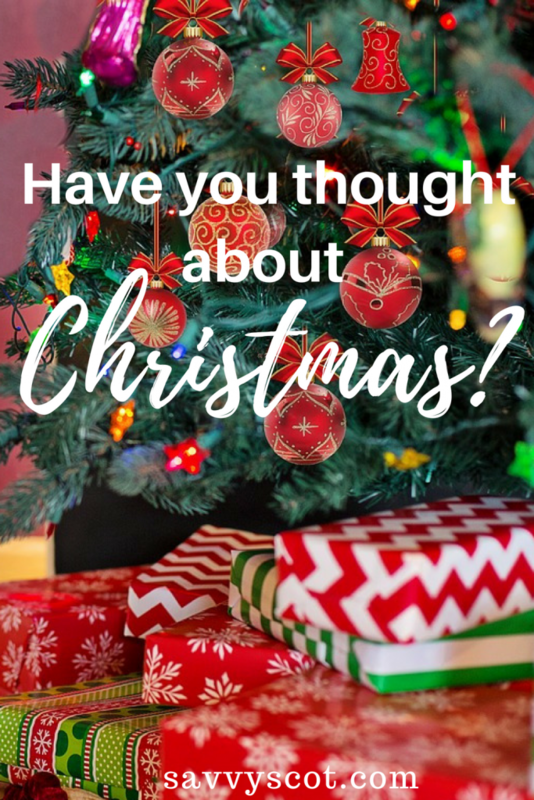 While I think that is insane, in order not to have to put the cost of Christmas on your credit card, and pay it over so many months the following year’s decorations will be in place, you should give Christmas a thought starting right now. In order to save for Christmas, you need to know how much you spend on Christmas. Unfortunately, that is not only the cost of gifts. Will you go out of town to visit family? Will they come over? How many people will you have to feed? A Christmas budget can also include tips to your mailman or teacher, chocolates for the building’s maintenance man, etc. Try to be thorough and put a price on everything you would like to spend around Christmas. A good idea is to keep a list over the year to write down great gift ideas for the whole family. Did grandma mention a gardening kit back in April? Jot it down on the list. Aside from electronics if Junior wants the last laptop, you can keep an eye open during the year for those great gift ideas going on sale. The gardening kit will probably be half off by the end of summer, and practically impossible to find in the dead of winter. One Christmas I wanted a bathing suit to go to Dominican Republic in February. I had such a hard time finding one, as I don’t have a common size, that I had to find a dedicated shop and fork over a small fortune to get my bathing suite in winter. A little more prep and I would have enjoyed the end of summer sale and gotten a bargain. So if you see a great Christmas gift in July, buy it, pack it, hide it until Christmas. It will also help spread the spending over the course of several months. The same goes for flights and train tickets, the earlier you buy, the better, and it will be easier on the budget. Aside from gifts, there are lots of free and cheap activities organized by stores, malls, councils, colleges… Read our post about cheap Christmas days out around London for example. Christmas markets, ice skating, winter gardens, or just window shopping at your favorite department store cost close to nothing and provides good fun for the whole family. The same goes for Christmas food. You can often find coupons, and enjoy discounts if you shop a few days before Christmas. Right after Christmas, you can stock up on cheap food for New Year’s Eve. All this will hopefully make Christmas more affordable for you. One of my favorite Christmas stories is Disney’s Christmas Carol, where Scrooge help Mickey’s poor family get a nice Christmas. Mickey is having a minimal supper where he has to cut a pea in half to give it to his kids, yet the whole family looks grateful and happy to be together. I may tear up a little if I watch it again. Anyway, Christmas is about being together (and even going to mass and celebrating the birth of Christ, but most people seem to have forgotten about that…), so instead of lavish gifts, just lit up a few candles and prepare a nice meal your family will remember. It doesn’t have to break the bank. If you can afford it, by all means, but if you are on a tight budget, don’t sweat it, it is better to have a low key Christmas than to be paying for it six months later at 29.99% APR. Now that you know roughly how much Christmas will cost you, take that number and divide it by the number of weeks left until December. That is how much you need to save every week so you can actually afford Christmas and not go into debt for it. Hopefully you will get a Christmas bonus or some cash gifts so you can also enjoy the after Christmas sales, but only count certain money in your savings target. You can open a dedicated savings account and get the whole family on board to you are all accountable for reaching your goal. Have you planned for Christmas financially? How much is your Christmas budget? I’ve found with Christmas presents, the thought means more than the price. I try to give experiences (concerts, theater plays, etc.) over shiz people won’t use and forget about come late January. The trouble for me is getting all us kids to spend approx. the same amount on our parents’ gifts. We’re all pretty spread in terms of income. I make 4 times more than my sister but am happy to get down to what she can afford for Christmas gifts. Although I wouldn’t mind paying more if it were something big. I was actually thinking about it last month while trying to hit a sign up bonus for my latest credit card. Stefanie @ The Broke and Beautiful Life recently posted..Why I’m Giving Up My Daily Latte. Trust Me, It’s Not Why You Think. Better 3 months than one week before! I really don’t put too much thought into Christmas because my family made an agreement four years ago to have a secret santa/grab bag and we only have to buy one gift for whoever we pick. My family is a little big so buying a gift for everyone is a sure way to go broke. Now we just get together and have a nice Christmas Eve dinner and only hand out one gift. Everybody is happy and the stress level is almost zero. Aldo @ MillionDollarNinja recently posted..50th Blog Post!!! That is a great idea. We don’t do gifts for adults, just spoil the kids. I keep a list of gifts on my phone and shop all year when I find items on sale. The problem is remembering where I hid everything! haha that happened to me once, my father got his gift on the 26th..
Well done getting that out of the way! I try to buy gifts for my family and friends throughout the year. Unfortunately, on occasion, I forget I’ve bought the gifts or forget where I’ve put them so end up buying extra presents – note to self: be more organised! 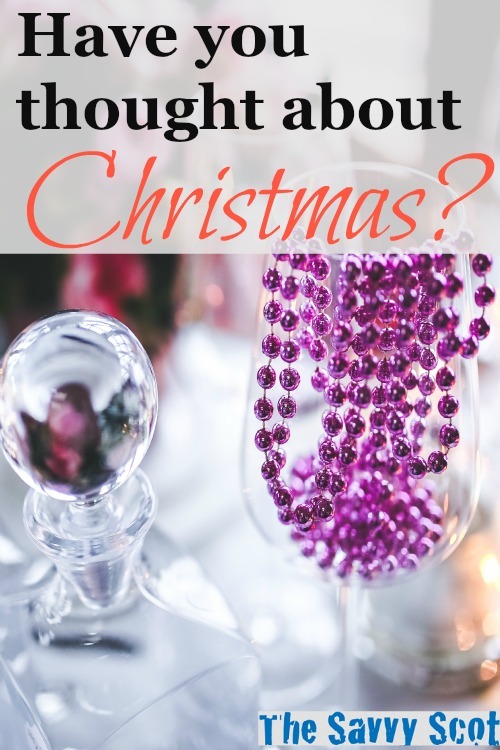 Some people love Christmas – I’m not one of those people! I just think it’s too commercial now – sometimes, it’s hard for me not to do my best Scrooge impression! Same here, although I appreciate family dinners and getting to see everyone in one place. I would always go into debt around Christmas. A few years ago, I started to save up for Christmas spending throughout the year – putting a little away each time I got paid. It’ helped me to avoid the whole debt/get out of debt cycle that happens to so many around the holidays. I have already bought around 50% of the gifts that I need. I try to do a lot of my shopping in the summer. Sometimes I don’t have a clue what to get, but I can usually manage something I think everyone will enjoy. I haven’t bought anything yet but I’m busy making my lists and preparing our budget. We usually use Rick’s extra check in December to buy Christmas gifts, so the cash is already set aside, so we’ve got that going for us. I will definitely be picking up stuff that I see on clearance if I think it fits one of the kids though. It’s always smart to start planning early. I have been thinking about it because I got burned last year because of the late amazon deliveries. Nothing better than giving your spouse a picture of what they will be receiving in the next few days after Christmas. Better planning this year.